Certass has introduced digital downloads for building certificates, to make getting certificates quicker, easier and more convenient for Certass members and homeowners. Jason Clemmit, Managing Director at Certass says: “As consumer trends have changed, lots of homeowners have come to expect electronic documents, rather than having hard copies come through the post. “Whether it’s bank statements, utility bills or even receipts from high-street shops, almost everything is done via email now, so that’s what consumers have come to expect from their home improvement installers too. That’s why we’ve made our certificates available electronically. It’s doesn’t only help homeowners, it makes life easier for members too. 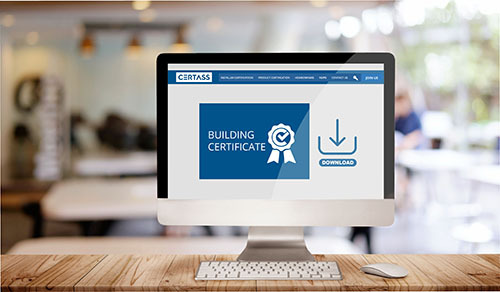 When a Certass installer registers an installation with an email address, an email is sent with full details on how to download building certificates from the Certass digital download portal. This can be done by the installer or the homeowner. Certass specialises in installer and product certification for a wide range of home improvements, ranging from glazing and solid conservatory roofs to roofline and extensions.